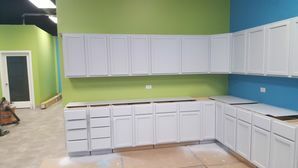 Cabinet painting in Western Springs Illinois is an inexpensive way to give your space a brand new look! The Western Springs cabinet painting experts use the highest quality paint and the most modern colors to give your kitchen or bathroom an amazing transformation. Whether you’re looking for a vibrant splash of color or a subtle change, Painter's Logic specializes in Western Springs cabinet painting. Did you know that using a semi-gloss finish will not only give your Western Springs cabinets a richer look, but also makes it really easy to clean? Painter's Logic will work with you to match colors and textures to ensure the finished product is better than expected. Providing superior cabinet painting in Western Springs since 1980, Painter's Logic has the expertise to instantly increase the value of your investment. On average, painting your Western Springs cabinets in a small-to-average size kitchen costs approximately $5,000-6,500. Full replacement of the same size would cost between $15,000-30,000. And in many cases, replacement costs could be greater than that as people tend to replace countertops in the process, leading to electrical and plumbing work. Why spend more than triple the cost by replacing? You can have a beautiful, newly updated-looking kitchen by painting your cabinets in Western Springs! No more outdated bathroom cabinets or boring kitchen cabinets. Call (630) 296-9280 for a free quote on cabinet painting in Western Springs.